Some of the selected devices on the website are currently being sold for almost half the retail price. Discounts of this magnitude on these smartphone models have not been seen in our research either online or on retail. The discounted models include Samsung J1 and J1 Ace, Samsung Ace NXT 2 and Microsoft Lumia 550. One of the most attractive features of the e-shop is the availability of EMIs for the customers. This is gradually becoming a hygiene factor online smartphone sellers as can be seen on Pickaboo.com and GP Shop Online. The EMI feature as advertised on the site is something we have yet to test out. Customers in Dhaka can purchase devices and get them delivered to their doorsteps without having to pay any charge for the delivery. On top of the discounts, the EMIs and the free home delivery, we also various Robi freebies that come with selected models. Freebies include free data and talk time. To avail the freebies all you need is to have a Robi phone number. As telecom operators venture into online device selling, the competition is likely to stiffen. This can only mean good things for the customers in terms of price points and other amenities. 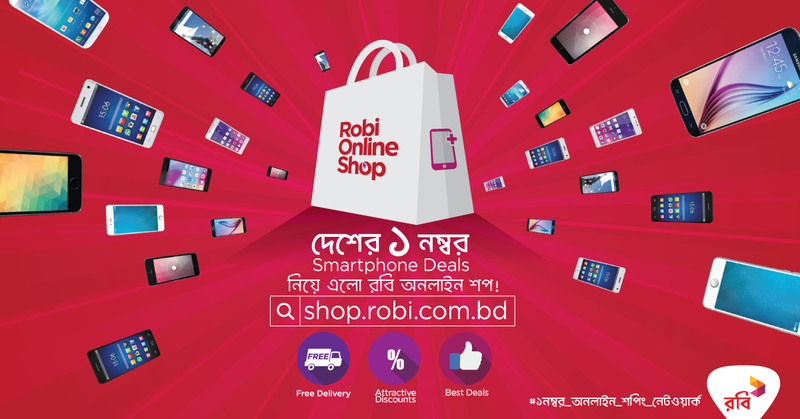 Robi’s entrance crowding up the online device sales space is a welcome change. Nokia 3310: Can it fight back in the smartphone era?